Three sharp new apartment buildings, with inscrutably marketable names like Vector, Hub9, and the Rowlock, border a tree-dotted plaza. Zipcars zip. Children frolic in fountains. The coffee shops, microbrew tap house, and organic grocery stand within convenient walking (or stumbling) distance. 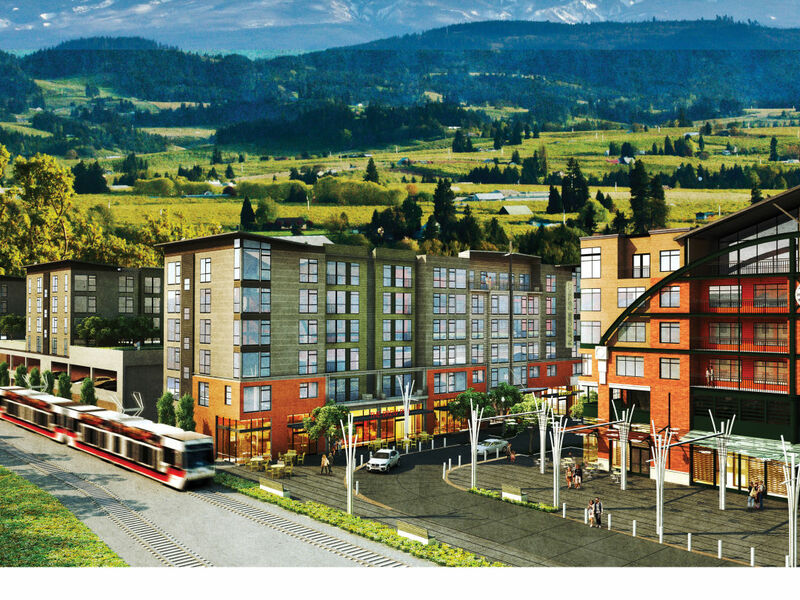 The Platform District, the newest pocket of Hillsboro’s Orenco Station neighborhood, became real last summer, fulfilling a vision of dense urbanity in the last major suburb before the metro area’s west side gives way to farmland: “city” living, 14 miles from downtown Portland. Suburbs across the country now want more walkable, denser development, largely to cater to emerging market trends. For greater Portland and its anti-sprawl boundary, places like the Platform District could be important in more than a commercial sense. By 2035, Hillsboro conservatively expects to absorb about 20,000 people, swelling to a total of 116,000. About 81 percent of those residents will work in Hillsboro—at Intel, Salesforce, or SolarWorld, for example—rather than clogging US 26 to commute to the center city. Located across from one of Orenco Station’s established 55-and-older communities, the Platform District’s three new apartment buildings are attracting mostly young workers with money to spend. Eighty percent of tenants are 36 or younger, with an individual annual income of $84,000. A one-bedroom in the gleaming Rowlock starts at around $1,400, which can include incentives like a Netflix subscription. After the third building is finished in July, about 1,200 people will dwell in the apartments, with access to pools and fitness studios.